​Personal income per capita (PIPC) serves as a useful measure of overall standard of living. PIPC represents the amount of money earned by the average individual and what is available for saving and consumption. 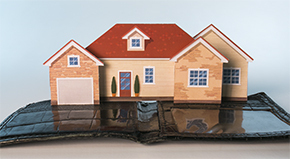 Housing represents the largest single purchase and budget item from an individual’s income. Given that PIPC has risen throughout the state (see publication No. 2136 “What’s in Your Wallet?”), the next step is to analyze the relationship between PIPC growth and changes in housing prices. Incomes and Ho​​u​sing Prices Linked? Housing prices are expected to keep in line with fundamentals of supply and demand. Factors affecting housing prices include interest rates, employment, changes in demographics, taxes, capital markets, availability of developed lots, and income. In the long term, prices are expected to keep in line with these fundamentals. However, they may diverge from the long-term relationship due to short-term shocks such as changes in employment. A major divergence from equilibrium often leads to speculation as to whether a housing bubble exists. Bubbles occur when irrational expectations of future prices by homebuyers cause elevated prices significantly above fundamental values. Debate exists regarding whether there is a long-term equilibrium rela​​tionship between income (either household or personal) and housing prices. If that is the case, and if housing price growth were to exceed income growth, eventually housing prices would need to slow down and become more aligned with income growth. Or, if income growth registered a higher growth rate, then housing prices would likely follow suit. While price and income changes over time generally trend upward, regional variations may exist. Regions across the U.S. exhibited distinct patterns with some experiencing income growth that exceeded housing price growth and some experiencing housing price growth that exceeded income growth. Texas PIPC registered growth rates similar to the ones observed in the U.S. from 1975 through 2015 and recently exceeded the national growth rate (Figures 1 and 2). The Texas Triangle metros—Austin, DFW, Houston, and San Antonio—have matched and exceeded the U.S. average and total growth rate, a result of the industrial mix of each region (see publication No. 2136 “What’s in Your Wallet?”​). Inflation-adjusted housing price growth in Texas has been relatively tame compared with the U.S., in great part due to the housing supply glut in the late 1980s that depressed prices through the 1990s. During the late 1990s and early 2000s, a relatively balanced supply-demand relationship kept housing price appreciation subdued while the rest of the nation was experiencing a housing boom stemming from loose credit conditions. 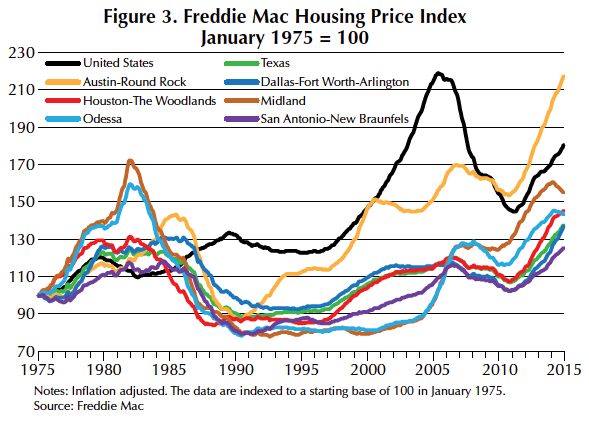 The Freddie Mac House Price Index (FMHPI) represents price activity from 1975 to 2015 (Figure 3). The U.S. exceeded Texas in housing price appreciation for most of the period. Texas and its metros experienced high rates of appreciation up through the early 1980s as the Texas economy boomed from energy-related growth. During the boom, the state’s economy outperformed the nation’s with greater rates of employment and income growth leading to higher income levels. At the same time, housing in the energy MSAs—Houston, Midland, and Odessa—exhibited strong price appreciation through 1982. The energy-driven boom prompted an increase in real estate construction in both the residential and commercial markets. Lenders were quick to make construction and mortgage loans in the booming Texas economy fueled by positive oil price expectations. As the national economy fell into a recession at the start of the 1980s, the Texas economy soon followed as oil prices slipped. The Texas economy faltered in the mid-1980s through the rest of the decade caused by further collapse in oil prices and the savings and loan crisis. This led to a muted Texas real estate market for years, as inflation-adjusted prices, which peaked in late 1984, reached a trough in late 1990. By contrast, real housing prices in the U.S. rose during this period. It wasn’t until the mid-1990s that real housing prices in Texas began to pick up momentum after the oversupply of houses from the 1980s was reduced, paving the way for a strong recovery in new housing construction. Recovery in the broad economy during the 1990s coupled with the tech boom created a resurgence in real price appreciation. 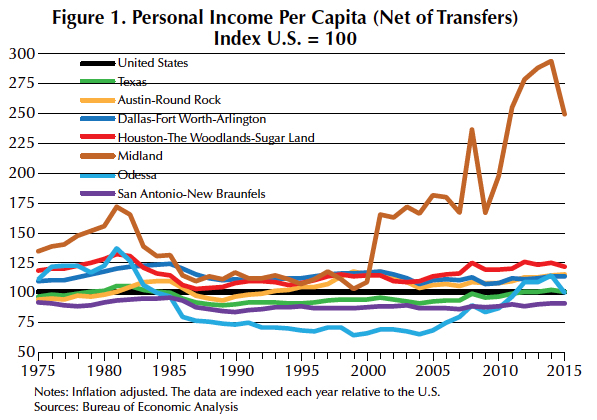 During the 1990s Austin emerged as a leader in both PIPC and housing price growth. The U.S. recorded a drastic run-up in real housing prices from the late 1990s through 2006, right up to the housing market collapse. Texas was shielded from the severe housing price appreciation and subsequent depreciation suffered by the rest of the country due to a balanced housing market. 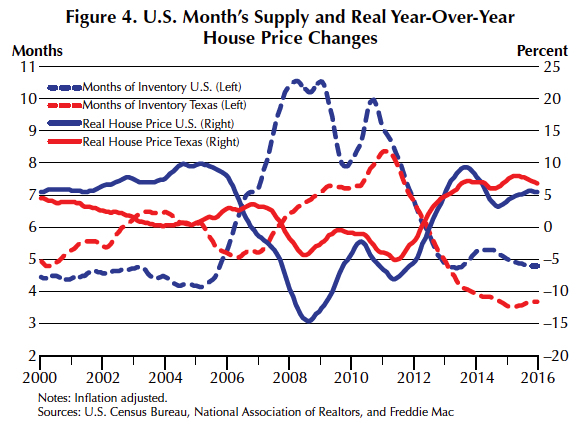 A quick look at the relationship between the months of inventory and real price changes reveals some of the differences between Texas’ housing markets and the nation’s (Figure 4). A balanced market is expected to be near six months of inventory. Housing prices are pushed higher when months of inventory is low. Alternatively, housing prices are suppressed when months of inventory is high. Leading up to the Great Recession, months of inventory was lower in the U.S. than in Texas, leading to higher housing appreciation rates nationally. However, as a result of loose credit in housing, adjustable-rate mortgages readjusting at higher rates, and the overall financial crisis, homeowners defaulted in masses, and months of inventory shot through the roof as foreclosures flooded the U.S. market. Housing prices plummeted nationally in both nominal and real terms. 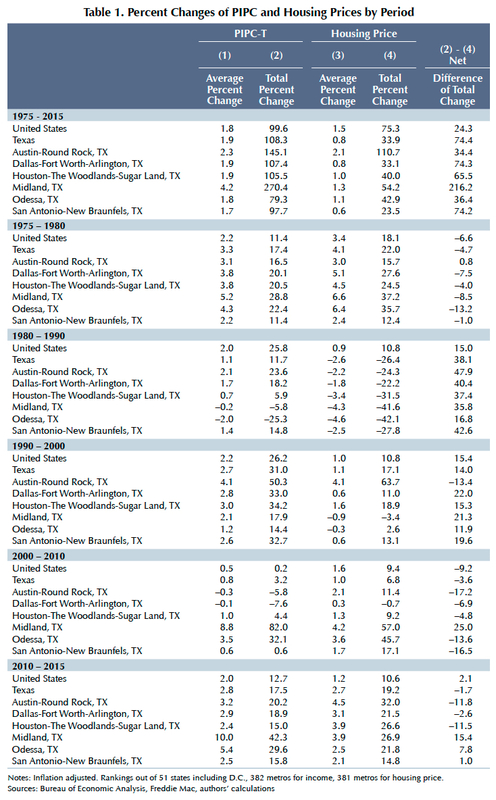 Texas experienced a much more limited decline in housing prices compared with the nation. Months of inventory increased moderately as sales volume dropped in Texas but not to the degree occurring at the national level. Since the bottoming out of the market during the Great Recession, housing prices have rebounded at healthy rates. The annual inflation-adjusted rate for the U.S. was 8.2 percent in 2013, 4.9 percent in 2014, and 5.2 in 2015. Texas experienced a 6.2 inflation-adjusted rate in 2013, 6.7 in 2014, and 7.6 in 2015. The U.S. also experienced high rates of growth in the early 2000s, from 5.8 percent in 2000 up to a high of 9.3 percent in 2005. Texas, however, had not recorded rates this high since 1978 (7.3) and 1979 (6.6). PIPC and housing prices have changed over the years in response to prevailing economic conditions. But has PIPC growth exceeded housing price appreciation? A comparison of growth rates for each region yields the answer. Why is this comparison important? Income growth that exceeds housing price appreciation means more money left in the pockets of homebuyers. 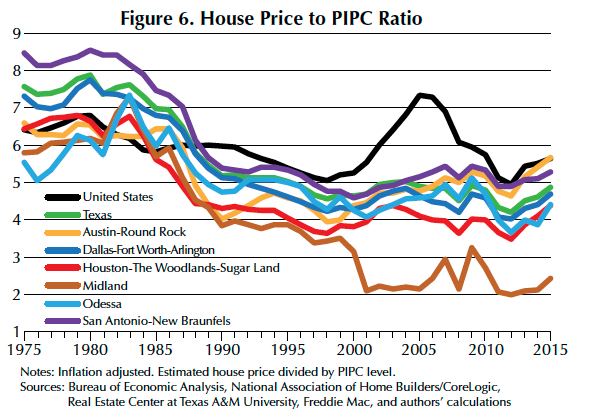 The relationship between PIPC and housing price changes for the U.S., Texas, and selected metros from 1975 to 2015 is shown in Figure 5. Table 1 summarizes the changes by decade. The U.S. and Texas exhibit diverging trends. PIPC growth in Texas has outpaced housing price growth to a greater degree than the U.S. as a whole. Dallas, Houston, and San Antonio have followed a trend similar to that of the state. Austin was the exception among the Texas triangle metros as housing prices consistently outpaced income growth depicted by an overall declining index since the late 1990s (Figure 5). Concentration in the mining industry boosted Midland’s PIPC growth significantly higher than its housing price appreciation since the turn of the millennium. Large swings in the industry also earned Midland the top spot for variability in PIPC growth, most of which occurred recently (Table 2). In 2008, PIPC jumped 40.1 percent from the prior year, slid 34.2 percent in 2009, increased a total 92.2 percent through 2014, and then fell 12.7 percent in 2015. Real housing prices were not as volatile during the same period and have generally increased except for 2015 (Figure 3). Another way to illustrate the relationship between changes in incomes and housing prices is to estimate how much more housing prices were, using a ratio (Figure 6). At the start of 1975, Texas (7.6) and the Texas Triangle metros all had ratios above the U.S. (6.4). In 1988, Texas converged with the U.S. and has consistently remained below the ratio observed at the national level since then. 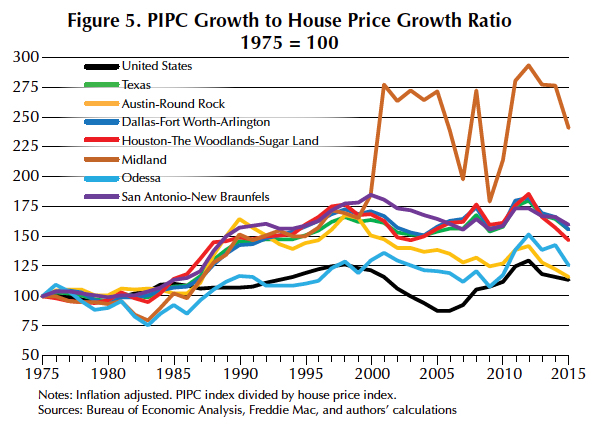 U.S. values of prices over PIPC during the 2000 decade up to the housing bust increased considerably, whereas Texas continued to see reductions in the ratio as PIPC outpaced housing price growth. The only major Texas MSA to exceed the U.S. ratio in 2015 was Austin (5.7). Texas ranks 17th for PIPC growth and 29th for housing price appreciation among the states (Table 2). Midland registered the highest average PIPC growth rate of all U.S. metros from 1975 to 2015 but ranks 87th for average housing price growth. Austin is near the top in both PIPC growth (15th) and housing price growth (34th). 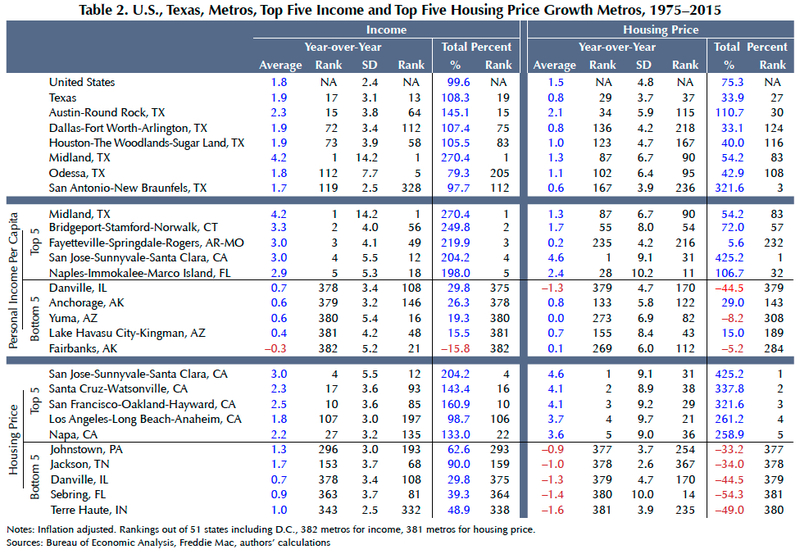 All the major Texas metros have PIPC growth that exceeds housing price growth over the total period. California has notoriously high housing prices and appreciation rates and is home to the top five metros for housing price appreciation. The state is second in the nation behind only the District of Columbia. Comparatively, the top five metros for PIPC growth are not concentrated in California. San Jose-Sunnyvale-Santa Clara makes an appearance in both top five lists (Figure 7). All the California metros experienced housing price appreciation that outpaced PIPC growth. 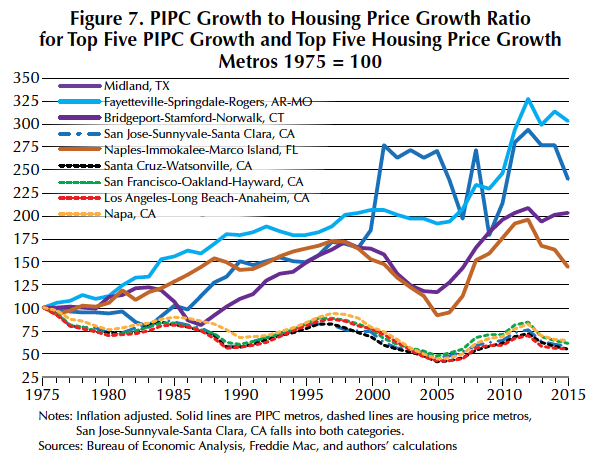 The non-California metros encompassing the top five for PIPC growth outgrew housing price appreciation over the period. Texas has benefited in the past from PIPC growth that has exceeded housing price growth, preventing major disruptions and keeping housing relatively affordable. Both PIPC and housing prices have been subject to broad economic effects and cycles, i.e., the energy sector. Each metro area is impacted by its regional economic mix. Booms in the energy sector lift PIPC levels and also act as amplifiers to changes in housing prices. Midland, Odessa, and Houston experienced rapid increases in housing prices in the late 1970s and early 1980s and again in recent years. Austin, too, had its fair share of housing appreciation as a result of expansion in the technology sector and its “cool” factor as a chic living destination. Texas has continually improved its residents’ standard of living through increases in PIPC thanks to the benefits of the energy sector and economic advantages Texas offers (for example, no state income tax, pro-business environment). From 1975 to 2015, the overall trend revealed PIPC growth greater than housing price growth. More recently, Texas real housing prices bottomed out in 2012 and increased faster than PIPC in subsequent years. A shortage of construction workers and the scarcity of developed lots has limited the number of new homes coming online. This has made it difficult to satisfy demand for homes, which pushed prices higher. This trend will likely continue unless the supply shortages in Texas markets are mitigated. If housing prices continue to appreciate ahead of income growth as trends suggest, the comparative advantage of greater housing affordability Texas has gained over the U.S. may narrow or even disappear in the foreseeable future. Personal income per capita (PIPC) and the Freddie Mac House Price Index (FMHPI) are the two main measures used in this analysis. PIPC is used to represent income growth. PIPC is computed for each geography and indexed to 1975 = 100 to demonstrate income growth for each respective geography. Other measures of income exist, such as household income and family income, but PIPC is used due to its broad coverage of geographies including the U.S., all of the states and metros, and being a long series—1969 through 2015. Our interest is in the income generated from participation in the regional economy rather than transfer payments which typically consist of government assistance during times of economic hardship. PIPC is net of transfers as it does not constitute earnings worked for. The FMHPI measures housing price appreciation or depreciation for the U.S., states, Washington, D.C., and metropolitan statistical areas (metros). The index uses a regression and repeat-sales methodology to control for differences in characteristics between houses. The repeat-sales methodology uses only houses that sold two or more times during the timeframe, which more adequately controls for any factors that do not explain the average change in housing prices. The index includes only single-family and townhouse properties that have conforming loans purchased by Freddie Mac or Fannie Mae, thus excluding nonconforming loans, planned unit developments, condos, and co-operative properties. Both PIPC and FMHPI measures are deflated using the personal consumption expenditure (PCE) index in order to represent real housing price changes net of inflation. The relationship between income changes and housing price changes is represented two ways. First, an index is produced which divides the PIPC index by the FMHPI. The resulting index is also indexed to 100 in 1975. From the base year of 1975, any movement in the index demonstrates the relationship between changes in PIPC and changes in housing prices. If the index increased (decreased), PIPC grew higher (lower) than housing price growth. If the index was above (below) 100, then cumulatively PIPC grew more (less) than housing prices. Second, the ratio of housing price levels to PIPC levels is estimated. This is done by using 2015 median house prices for each geography and multiplying by the FMHPI, where 2015 equals 1.0. Median price for the U.S. is provided by the National Association of Home Builders and CoreLogic. Median price for Texas and its metros is proved by the Center. The resulting house price series is then divided by PIPC to estimate the ratio between house price and PIPC levels. PIPC and housing price movements for 1975 through 2015 are summarized based on the average change, but for any given year the change is not always the average. For Midland, the top PIPC grower, changes are not always the average 3.6 percent and can take large swings in positive or negative directions. Standard deviation provides a measure for this variability of growth and is reported in Tables 2 and 3. Midland may have the largest on average PIPC growth rate, but it also has the largest standard deviation, or variability in growth. Standard deviation for housing price growth is also reported in Table 2. Even though PIPC growth exceeded housing price growth for the U.S. and Texas, housing prices, exhibited greater volatility, illustrating that housing prices are more prone to larger swings than PIPC. Housing prices change with fundamental drivers such as income, but may also be amplified due to overreaction. Market participants may give in to the belief that housing prices will continue to rise if they have risen in the past. This belief in conjunction with currently rising income can fuel appreciation above fundamental values. When income growth slows or declines, a correction in housing prices can slow or decline at an amplified rate. ​Day (wday@mays.tamu.edu) is a research associate, and Dr. Torres (ltorres@mays.tamu.edu) is a research economist with the Real Estate Center at Texas A&M University. Case, K.E. ; Shiller, R. (2003). “Is there a bubble in the housing market?,” Brookings Papers on Economic Activity, No. 2, 299–342. Duca, J.; Weiss, M.; Organ, E. (2015). 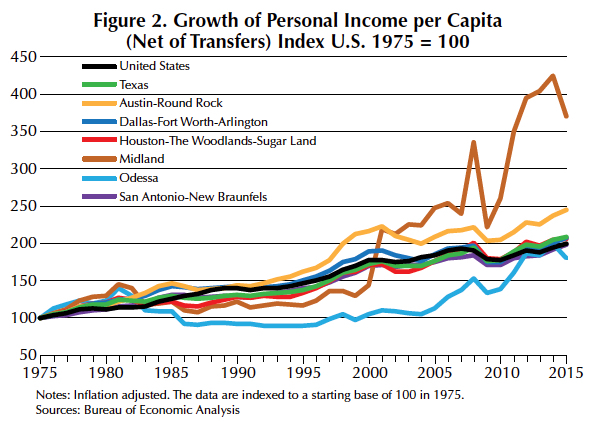 “Texas Real Estate: From the 1980s’ Oil Bust to the Shale Oil Boom,” Ten Gallon Economy Sizing Economic Growth in Texas, Dallas Federal Reserve, Palgrave Macmillan, 2015. Gallin, J. (2006). “The long-run relationship between house prices and income: Evidence from local housing markets,” Real Estate Economics, 34(3), 417–438. Holly, S., Pesaran, M.H. and Yamagata, T. (2010). “A spatio-temporal model of house prices in the USA,” Journal of Econometrics, 158(1), 160–173. Hunt, H. (2009). “Old School: Lessons from the ’80s and ’90s,” Tierra Grande, Real Estate Center at Texas A&M University. Nakajima, M. (2011). Understanding house-price dynamics. Business Review, Federal Reserve Bank of Philadelphia, 2, 20–28. Ortalo-Magne, F., & Rady, S. (2006). Housing market dynamics: On the contribution of income shocks and credit constraints. The Review of Economic Studies, 73(2), 459–485. Torres, L. B., & Day, W. (2016). 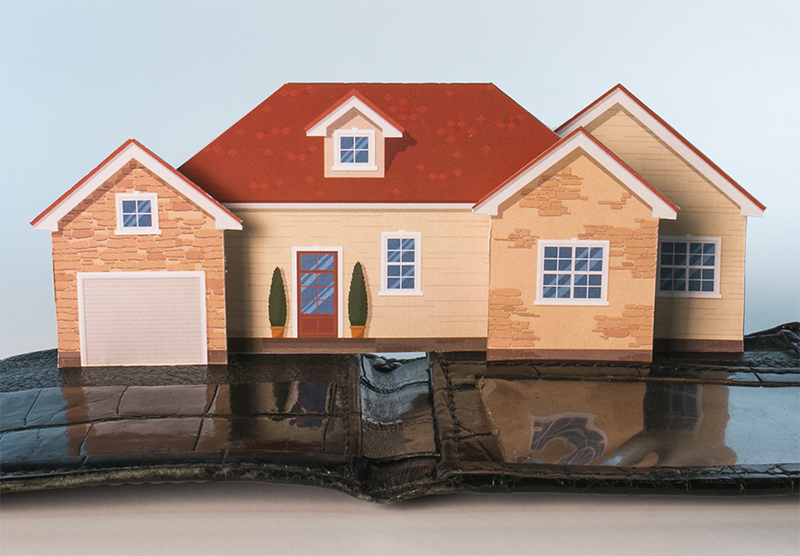 “What’s in Your Wallet?,” Tierra Grande, Journal of the Real Estate Center at Texas A&M University.